EGIS provides reliable, real-time water well and hydrogeologic information from borehole surveys. 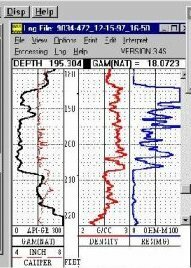 Our down-hole video and geophysical tools identify water production zones, rock strata, well geology, and well construction. By evaluating site-specific concerns, we can design and implement cost effective solutions to your well problems. EGIS maintains close working relationships with regulatory agencies and is aware of the latest rules that may affect our clients. Our borehole surveys guide water well repairs, drilling operations, and groundwater investigations. We reveal how a well produces water or where to install a packer, liner, casing, or well screen. EGIS field personnel record and interpret video and borehole logs to characterize water wells, diagnose well problems, and plan repairs. Whether installing a new well, repairing an existing well, or characterizing a monitor well, we enable you to plan your site work with confidence.